If one thinks of the stereotypical North American suburb, images that often come to mind are large single-story tract housing, cul-de-sacs, parking lots, wide roads and shopping malls. In short, developments built at a low density and often described as urban sprawl. While this is how many suburbs begin, it is important to note that their development is not a static process. In fact, if we look at many suburban areas today, we can clearly see a trajectory of development which, over time, can transform them from sprawling developments into urban neighbourhoods. To illustrate this point, several suburbs from in and around Toronto will be used as examples. Some of the first suburbs to emerge in North America were built at the start of the Twentieth Century. Concentrated along roads which radiated out from city centres, they gave the city a star-shaped form and were named ‘Streetcar suburbs’ for the mode of transport which was central to their development. Their urban form was significantly different from the dense cities they left behind: apartments, row houses and duplexes were replaced by larger detached and semi-detached housing, and functions were separated so that factories were no longer situated right beside housing. Over time, streetcar suburbs intensified and the densities increased. In some cases, the streetcar lines were replaced by rapid transit, which led to further densification around stations. Some major intersections which began as low rise shopping corners have become transformed into major destinations. Gradually, the moniker of ‘suburb’ was replaced with that of ‘urban.’ North Toronto, the area where I grew up, is one such example of an early suburb evolving into a fully fledged urban neighbourhood. It developed in the 1920s when a trolley line was extended beyond the old city limits. After World War II, density increased along the major thoroughfares, particularly at large intersections. This was stimulated by a subway line which opened in 1954. Streetcar suburbs were not generally built with the car as the primary means of transport (though there were numerous provisions, such as driveways and wider roads, which were taken into account). What about the post-war suburbs, which were planned for one- and two-car households? In many such suburbs, we can see similar processes of intensification taking place, albeit often very slowly. The early post-war suburbs (now known as the inner-suburbs) of Toronto began their lives like many North American communities built in the twenty-five years after World War II. They featured low-density, single-family houses and acted as bedroom communities for the city proper.The region’s first shopping malls emerged around major intersections and highways allowed commuters to travel downtown quickly. When they were first built, there were no subway or streetcar lines, and the population had to rely on either slow feeder buses taking them to the ends of the subway lines, or their private cars (the more popular of which was the latter, of course). However, like all communities, once the initial construction was completed, they began to evolve and change. Some of the first changes to take place were the construction of high-rise apartments, often located along major roads or near highway exits. While some of these buildings were constructed concomitant with the single-family houses, many more were built in the subsequent years and decades. This gave the landscape clusters of density surrounded by sprawl.From the late 1960s, the subway was expanded into these suburbs, and, like the process seen with the streetcar suburbs, densities began to spike around stations. Land use slowly became more mixed, and development more vertical than horizontal, so that nodes which featured not only high-rise houses, but also offices, shopping, recreational and cultural amenities could be seen Rather than being bedroom communities, they started to become destinations in and of themselves. The Yonge Street subway extension into North York (the area beyond North Toronto) in the 1970s is a good example of this transition. When the suburb developed in the 1950s, Yonge Street was characterised by low-rise strip malls and small low-rise apartments. Today, high rise condominiums and offices dominate the street and it has become a destination for theatre and movies. Similar intensification of post-war suburbs can be found around Metro stations around Washington DC. In the first two examples, it was rapid transit which was a major catalyst for the increased density of the suburbs. But can we see evidence of this trajectory without subways? Mississauga, a large suburb to the west of Toronto, is currently experiencing this process. The suburb is the largest in the Greater Toronto Area, and is in fact the sixth largest municipality of Canada, with a population of over 650,000. Its first phases of development were also characterised by low-density sprawl, typical of most North American suburbs since 1970. Few high rises punctured the skyline of bungalows and duplexes and the suburb lacked a distinctive core or central place. Office parks, shopping malls and sprawling factories dominated the rest of the landscape. However, by the end of the 1990s, Mississauga faced a problem: it ran out of land. Most of the land within its boundaries had been developed in typical sprawl style and there was very little farmland left to develop into houses, offices or factories. The boundaries of the suburb could not be expanded because it was surrounded on three sides by other communities and by Lake Ontario to the south. If developments were to continue, they would have to go upward, rather than outward. The most logical place for higher density development was surrounding the major shopping mall, and new Civic Centre, which opened in 1987. Built to look like a futuristic farmstead, when it opened, it was one of the few buildings of any height in Mississauga. Since then, it has been dwarfed by high-rise condominium and office developments in its vicinity, as well as cultural and recreational facilities. 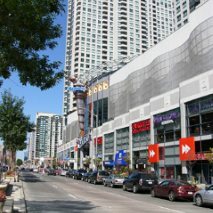 While it is still suburban in nature, Mississauga City Centre is a ‘downtown’ of sorts and densities rival those of some urban areas. Originally, suburbs were built almost exclusively of single-family dwellings. There were few provisions for groups such as singles, childless couples or the elderly. By having a range of housing styles, groups such as first-time buyers who grew up in the suburbs, or empty-nesters who raised their children there, now have the opportunity to spend more of their housing careers in the suburbs. Developers clearly see a market for this type of suburban housing, and planners and politicians are also keen to cash in on condominium projects without having to spend money on extending municipal infrastructure into undeveloped farmland. The increased density currently being seen in Mississauga has also affected demand for public transit. As we have seen with earlier suburban expansion, subway and streetcar construction spurred the intensification of the suburbs and the gradual transition from suburb into city neighbourhood. However densities already have increased so much in parts of Mississauga that plans are being made for light rail lines in order to relieve overcrowded bus lines. These will provide better links to its own downtown, as well as with the city of Toronto proper. Many urbanites do not like the suburbs. From an environmental perspective, they can be very unsustainable. However, the suburbs are not going to go away. They remain popular places for those who live there, and developments geared to low-density, auto dependence have been a part of our landscape for more than eighty years. They are where the majority of inhabitants living in a metropolitan area live. But suburbs, like the city, are not static. They evolve and grow over time. For a suburb to evolve into a more urban environment, this growth needs to be more upward, rather than outward. There is a large opportunity to help suburbs evolve into sustainable communities where the car is not the only option, and different uses and functions can find their own place. History has shown that this has already happened in other parts of the city. We have a great chance to influence the future patterns of existing communities. It is clear that less car-dependent neighbourhoods are essential to a sustainable and liveable future. This does not mean destroying existing suburbs, but it does require planning, infrastructure and commitment. Developers have clearly seen a market for higher-density dwellings around suburban nodes. Politicians and planners must work to ensure that the types of development which take place help to create liveable communities. If this is done correctly, previous examples have shown us that the single-use, low-density, car-dependent suburbs of our parents and grandparents can evolve into urban neighbourhoods. The impact of a subway line on a streetcar suburb from the early 20th Century is obvious. Around stations, high rises offices and condominiums have created a new destination, and the area is now an urban neighbourhood. When the intersection of Yonge and Eglinton was first developed in the 1920s, one- and two-story buildings were the norm. In early post-war suburbs, the impact of transit improvements can also be seen. Yonge Street in North York has fully developed into a more urban, rather than suburban space (photo Michael Doucet). Intensification can also be seen in the car-dependent suburbs built after 1970. 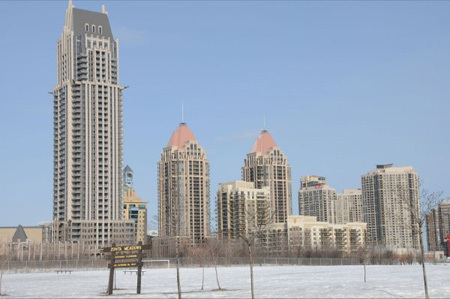 The Mississauga Civic Centre (second building from the left with the small clock tower) is now dwarfed by condominium developments, giving the suburb its own distinctive skyline. Development has been so concentrated that plans for rapid transit are being developed to meet demand and ease congestion (photo Michael Doucet).